At first, traditional incumbent businesses seemed to neglect N26’s existence. - About five years ago, they did not take us seriously. If we called ten banks when we were looking for a partner, about eight of them did not pick up the phone. At that time they thought our business model was unrealistic - Maximilian Tayenthal, co-founder and CFO of N26 told me. Together with his boyhood friend Valentin Stalf, they went on a mission to “Spotify” banking and challenge the low quality of digital banking products. Note: this post has been updated, to reflect the N26's hypergrowth, plans towards US market, new funding record and international expansion. It turned out that their “no physical retail branches” strategy is possible. It also turned out that customers are eager to trust the app-bank with a suite of mobile banking services designed for smartphones. And investors are eager to bet their money on the N26’s strategy and team. N26 has first raised $160 million in 2018 (a record for a fintech company in Europe at that time). In March 2019, investors poured a fresh $300 million in a Series D funding round led by Insight Ventures, valuing N26 at $2.7 billion. ‘N26 is a clear frontrunner in mobile banking’ said Solmaz Altin, Chief Digital Officer of the Allianz Group. First neglected, today N26 is the role model for the best user experience in mobile banking in Europe. The Berlin-based fintech built a beautifully designed app-bank, has its own banking infrastructure, a full banking licence, and over 2.3 million customers scattered across 24 markets. And it's not stopping there. By the end of 2020, the German company wants to reach around 5 million customers and expand beyond Europe. It has announced plans to expand in Latin America, with Brazil as the first market. The US market entry is on this year’s road map. 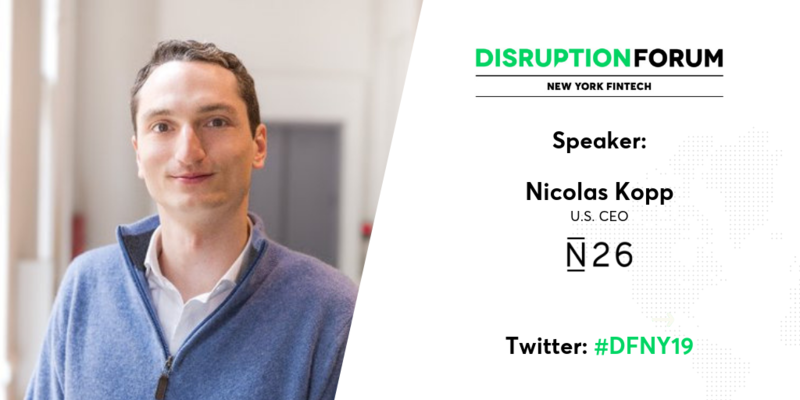 So we've invited Nicolas Kopp, US CEO at N26 to our Disruption Forum in NYC to discuss company's plans and ambitions towards US banking industry. N26 is also backed by the world’s renowned investors like Allianz X and Tencent Holdings as well as one of Silicon Valley’s best-known investors Peter Thiel, or the Chinese billionaire and telecoms magnate Li Ka-shing. Whoever doubted that this digital underdog would become a valid threat to high street banks is probably having second thoughts now. And the N26 journey goes on. The founders have already envisioned an even greater future for this venture. - We want to become a full replacement for any other bank account in the markets we operate in - CFO of N26 said. I spoke to Maximilian Tayenthal about N26’s vision, challenges and blockers. And about why he thinks that they need to remain agile forever. Tomasz Grynkiewicz, Netguru: With more than 850,000 customers and a banking licence, what will N26 look like in 2020? Maximilian Tayenthal, co-founder of N26: Our vision is to build a bank the world loves to use. Our focus is on growth. We want to become a full replacement for any other bank account in the markets we operate in and reach 5 million customers by then. Sounds like an ambitious goal. We know how to scale our business. We founded in 2013, launched in January 2015 and grew to 100,000 customers in the first year. It took us only five months to increase from 300,000 to 500,000 customers last year and have over 850,000 now. We are gaining, on average, 2,000 new customers every day. Maximilian Tayenthal and Valentin Stalf, co-founders of N26. N26’s growth path, much like the ones of some of your competitors - Revolut or Monzo - surely surprised the banking institutions. We do not occupy ourselves with incumbent players. About five years ago, they did not take us seriously. If we called ten banks while looking for a partner, about eight of them did not pick up the phone. Back then, they thought our business model was not realistic. Today, we are the role model for the best user experience in mobile banking in Europe. Our inspiration comes from Spotify and Google Maps, who offer a great user experience, not from retail banks. I think the banking products are still far from what they should look like. The old industry missed its chance to reinvent? I think we will see significant changes in the banking industry in the next 5-10 years, as well as shifts in market share. Some traditional players will accelerate their digitalisation efforts successfully, and others will fail. As far as N26 is concerned, we are working and will continue to work together with the most innovative fintech startups and traditional players to offer our customers best-in-class products on our marketplace within the app, so partnerships in this area are always on our roadmap. N26 doesn’t disclose its financial records. What about your business model? Our revenue streams are similar to those of traditional banks. We earn money on interest and commissions. The major difference is that we operate on a much lower cost base without an expensive branch network and outdated IT systems which require high maintenance costs. We pass these benefits on to our customers. Many people doubt that fintech is able to make money. We lost money with customers when N26 was newly launched and we operated on the infrastructure of a partner bank. But we were never focused on short-term profits or customer monetisation early on. We chose this path deliberately. Today, we have our own banking licence, our own infrastructure and make money with each customer. 160 millions USD raised recently, that is a lot of resources in your war chest. How are you going to spend it? We want to fuel our growth, invest in the product and market expansion. As a bank of the future we believe we can take our platform to the next level by increasing the usage of artificial intelligence. Banking will be even smarter and more personalised than it is today, products will be customised to the individual. The AI will allow us to become more adaptive to customers’ needs and, based on their financial behaviour, solve problems in a way that is currently missing in the industry. As far as I know, N26 has a very ambitious market expansion target ahead for this year. We have already announced our plans to enter the US and UK markets in 2018. The UK is one of the most advanced markets in Europe regarding digital payment methods. Non-cash payments and e-commerce are the accepted norm. These advancements in technology have fuelled strong demand for a fully fledged mobile banking experience. The US is an exciting new market which offers a massive opportunity for N26. Though the fintech environment is well advanced there, serving US customers comprises primarily niche and individual solutions. As of yet, we do not see any genuinely mobile bank which is a potential full replacement of any other bank account. What are the significant challenges in the industry which could impact N26’s vision? We are operating on a European Passport (a banking licence granted by the German regulator Bafin and the ECB), but we see that a pan-European banking alignment is missing. The same applies to compliance topics, such as IBAN discrimination. Although there is a European standard on IBAN, in some countries customers experience discrimination. What are the major internal challenges? We must remain an agile company. The factor for success for larger companies is to retain your innovation power, regardless of whether you have 300, 600, or more employees. This is one of the most significant challenges. Have you met with any significant surprises and disappointments during the process of building N26’s market position? 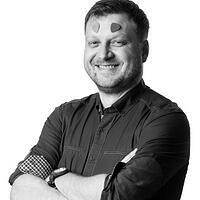 Hiring tech talent in a highly competitive environment. Same applies to other job profiles, such as marketing, where the overall education is still very much focused on offline marketing. I think that if European countries want to stay competitive, they should boost education to cater to the development of digitalisation. How do you define your customers, who is your primary target? The majority of our customers are so-called ‘digital natives’ up to 35-years old, yet 40 percent of our customer base is over that threshold. I think it’s fair to say that N26 is attractive to all digital customers who are looking for an easy to use, fast, transparent and contemporary enterprise mobile experience. In your view, what are the essential features and values that make N26 stand out from the fintech crowd? We have re-designed banking for the smartphone, not just developed another interface. Every feature or product is available with only one click directly in the N26 app. All processes (credit checks, applications for overdraft, signing up for our insurance wallet, for fixed-term savings or investments) take place in real-time. You can lock and unlock your card, as well as change your pin, within the app. Everything is fully digital without any paperwork. Opening an account only takes 8 minutes. We implemented 3D Mastercard Secure Code last year - it was the first native app integration, and it made our online payments even safer. What is the customers feedback? Do N26’s users value such features? We have proof that they do. More than 50% of our growth is organic, primarily driven by recommendations from existing customers who value the N26 user experience. 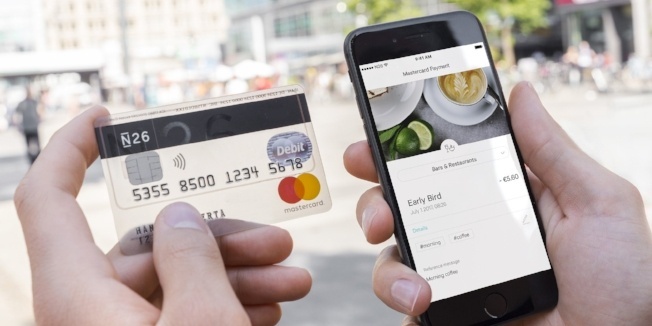 N26’s is partnering with the most innovative fintechs and traditional players. Why not go alone, as you did with your licence, infrastructure and platform? We want to offer our customers the best products on the market. We partner for example with TransferWise for international money transfers, we partner with Vaamo for investments, with auxmoney for consumer credit, with Raisin for savings, and with Clark for insurance wallets and insurance services. Adding to this, our latest premium product, the N26 Metal, comes with an exclusive partner program tailored to the needs of the digital community, such as access to WeWork facilities. There are new legal changes in the EU market - new directives and legislation dealing with the fintech industry. Do you treat it as a threat or an opportunity? We are regulated the same way as any other traditional German or European bank, and therefore possible fintech legislations are not a threat to us. As to PSD2. The directive will bring significant changes to the banking industry for years to come, and will drive innovation and competition in the European market. On the one hand, it offers tremendous opportunities for financial institutions, but also for technology players, to better fulfil the business needs of customers. As for customers, accessing the best products in the market from various providers will become much more convenient. Having an account with one bank does not necessarily mean that you have to use it for all other financial products and services. If you had the chance for a quick retrospective, what would be the advice you would give to the N26 of 2013? I would keep it simple. Always solve a customer problem which is big enough. Get customer feedback early, and become independent as soon as possible to drive innovation and control costs. What would be your word of advice to somebody setting up a fintech startup in 2018? What should they focus on first? Meeting regulatory demands (where applicable), funding facilities, developing a product which solves a problem and has a market. 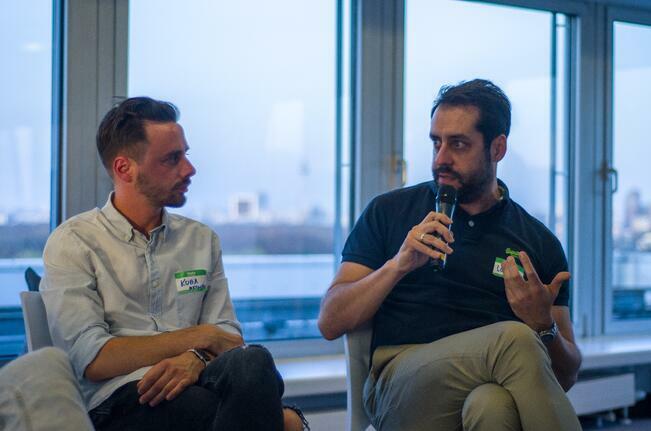 Lorenz Jüngling, Chief Product Officer of N26, was one of our guests at Netguru's Disruption Forum Berlin Fintech. Stay tuned to our blog for finest fintech insights.